The Data Tools contribution offers features to allow you to work with a variety of databases. 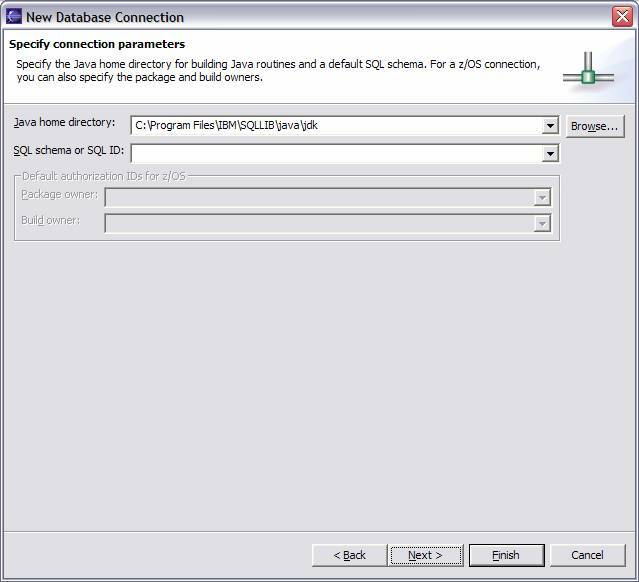 You can connect to the database, load and view database objects, sample the contents of tables, and execute SQL statements and commands. This information will get you started using these features. 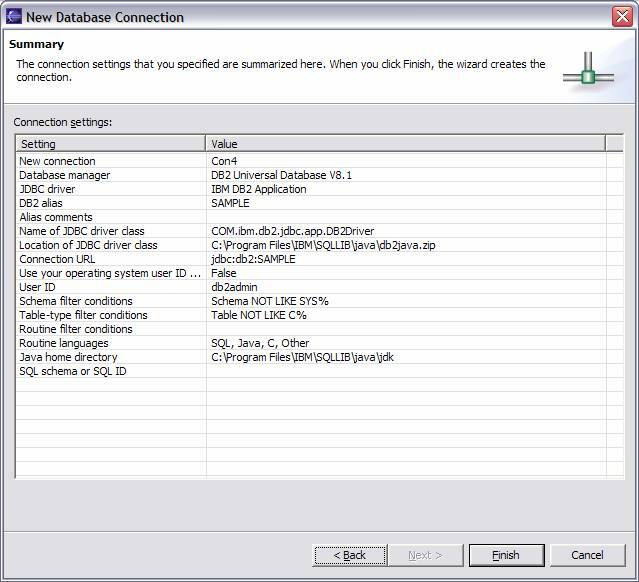 Before using the Data Tools components, you will need to have access to a supported database and the information required to connect to it. The following sections give step-by-step instructions on how to use the Data Tools functions. 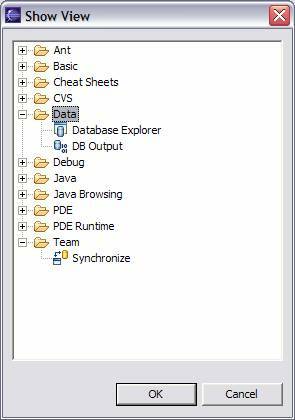 The Data Tools provides two views: the Database Explorer view and the DB Output view. 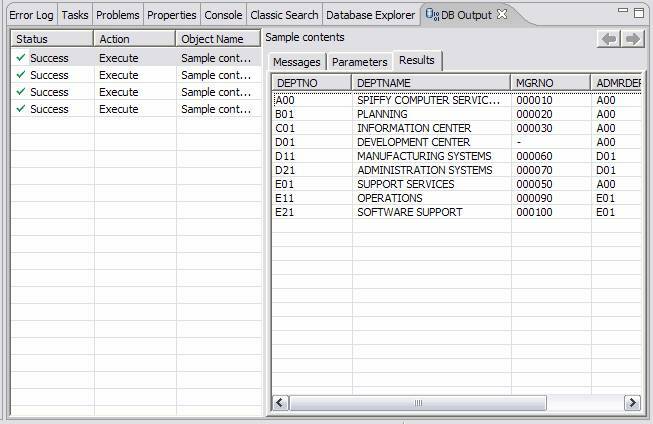 The Database Explorer view is where you will create connections, view your database objects and launch actions from those objects. The DB Output view is where query results and messages are displayed. To open the Database Explorer view, select Window->Show view->Other->Data-> Database Explorer. To open the DB Output view, select Window->Show view->Other->Data-> DB Output view. 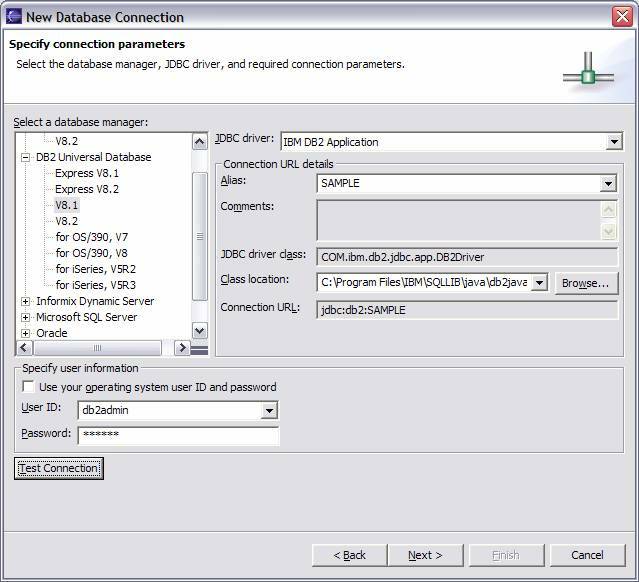 You can connect to a variety of database systems using the Connection Wizard. Once connected, the database metadata is loaded, allowing you to view the schemas, tables, columns and their data types. The Connection Wizard can be launched from the New Connection item in the context menu of the Database Explorer (right mouse click on Database Explorer View). 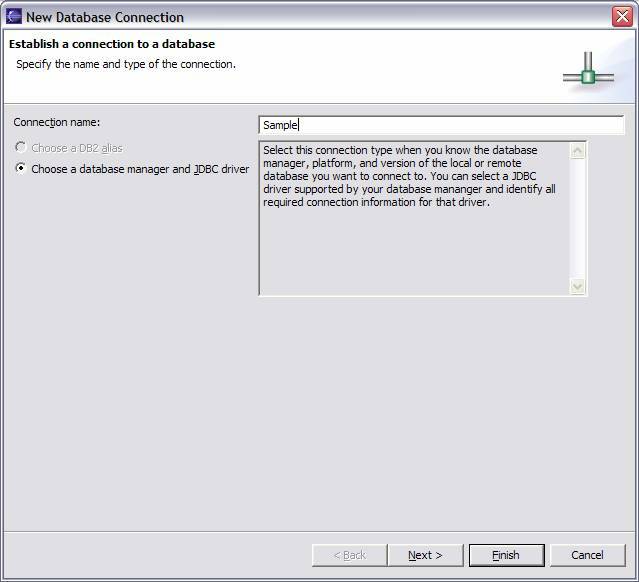 Ensure the "Choose a database manager and JDBC driver" radio button is selected and press Next. 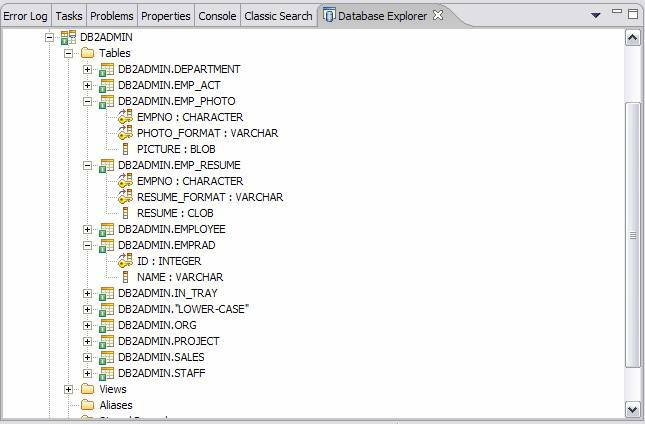 In the Select a Database Manager tree, expand the DB2 Universal Database node and select V8.1. In the Alias field, type "SAMPLE". Press the Test Connection button. After a successful connection, press Next. 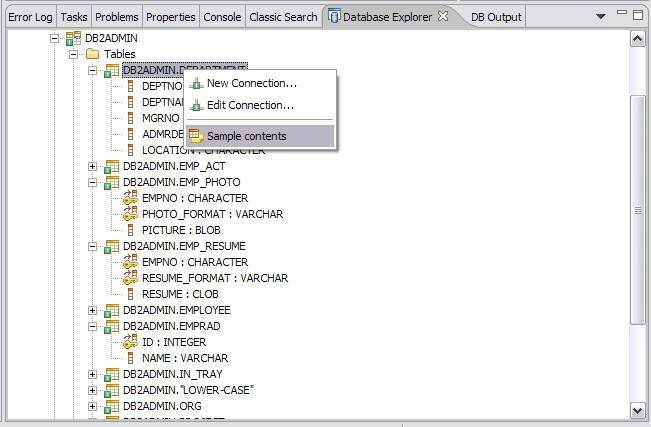 On this page you can filter the database objects that are retrieved. To add a filter which excludes tables that start with "C", press the Add button to the right of the Table and Routine filter grid. In the Add Object Filter dialog, select Table for the Target field, select NOT LIKE for the Predicate field and type "C%" (without the quotes) in the Predicate field, then press OK. Back in the main wizard page, click Next. Note: If you are connecting to a database with a large number of database objects, it is important to filter appropriately to reduce the number of tables returned. Review your settings and press Finish. The database metadata will load. In the Database Explorer, you will see a tree structure representing your connection and the database objects retrieved. You can sample the contents of a table and see its data appear in the DB Output view. 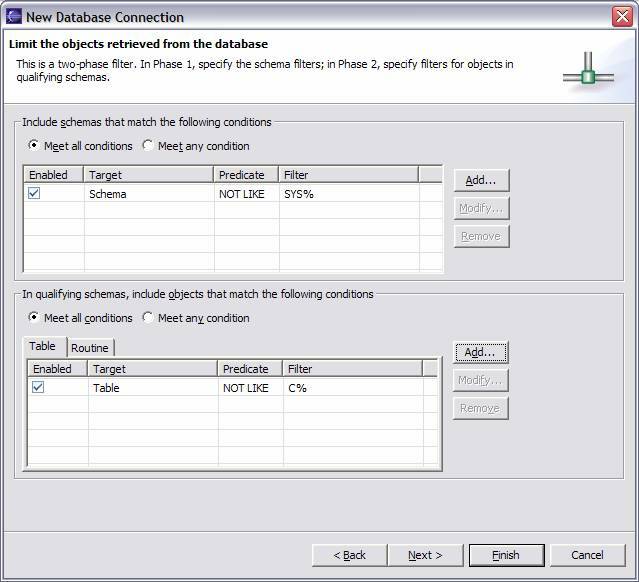 To sample the data from a table, expand the connection, database, schema and Tables nodes in the Database Explorer. Using a table's context menu, select Sample Contents. This displays the table's data in the Results tab of the DB Output view. The Data Tools offer a way to execute SQL statements and commands through its SQL Scrapbook editor. To invoke the SQL Scrapbook, select Open SQL Scrapbook from the connection node context menu in the Database Explorer. The SQL Scrapbook opens in the editor area. 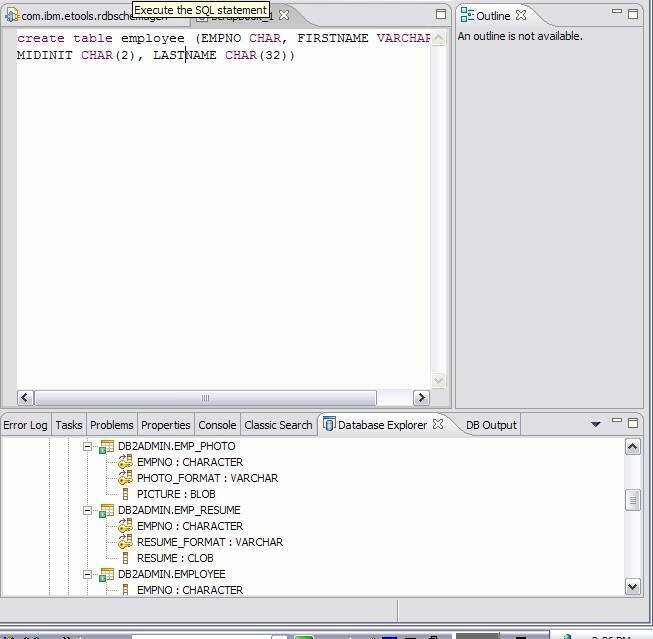 Type a SQL statement or command then execute it by selecting Execute from the SQL menu or by selecting the Execute icon in the toolbar. CLOB and BLOB data types do not display well in the DB Output view.